A concise, readable account of the principles underlying embryonic and appendage development in animals and plants, illustrated with colorful artwork and interviews with prominent investigators. Highly recommended for use in undergraduate and graduate courses. The “central dogma”—that DNA, the heritable genetic material, is copied into RNA, which directs the synthesis of protein—is a basic tenet of life. How this idea guided important discoveries in developmental biology is described using examples of the Gurdon experiment, which proved that all cells in a frog contain the same genetic information; the nature of heritable mutations; and the Mangold-Spemann experiment, which showed that a specialized region of the frog embryo directs the formation of the nervous system. Techniques developed during the past 30 years have provided powerful tools for analyzing development. The most important of these—gene cloning, methods for showing gene activity in developing embryos, and methods for analyzing and manipulating gene activity—are described. Establishing a plan or pattern for development of the fertilized egg is the key event in producing a differentiated embryo with different tissue types. This process in the fruit fly is described using the ground-breaking work of Eric Wieschaus, Christiane Nüsslein-Volhard, Gerd Jürgens, and Ed Lewis who found the genes that are required for normal development by looking for mutants in which development was abnormal. Assembly of the adult fruit fly during metamorphosis is the focus here, particularly the development of fly wings, legs, and eyes. These processes are explained by describing the small set of genes that define the primary axes of the wing, linking the formation of an adult structure to earlier events in embryonic development, and discussing the question of whether or not there are “master” genes that direct the formation of eyes. Although higher on the evolutionary scale, vertebrate embryos use many of the same genes as the fly embryo does to set up the primary body axes and tissue types. And even more remarkable is the fact that vertebrate genes involved in early embryonic development can replace their fruit fly counterparts in developing flies and vice versa. The experiments that revealed these astonishing facts and their implications are discussed. Here again is the unexpected finding that genes involved in defining adult structures such as appendages and eyes are the same in vertebrates and flies. The evolutionary implications of the similarities of fly and vertebrate development are discussed, and the most recent common ancestor of flies and vertebrates is reconstructed. Using the mustard plant embryo as an example, important differences between plant and animal development are illustrated. The polarization of the plant embryo along the shoot-to-root axis, as well as radial organization, is shown using analysis of mutant plants that generate abnormal embryos. Similarities between plant and animal development are also discussed. The formation of the plant equivalent of appendages—flowers, fruits, and leaves—are described. Topics include: how flower buds develop into four basic organ types, Goethe’s inference that all organs of the flower are modified forms of leaves (he was right! ), and the finding that while very different genes in plants and animals control formation of flat structures such as leaves or wings, these genes work by surprisingly similar mechanisms. We are very rapidly making progress in understanding how genes control development and other human characteristics. The social implications of these discoveries—how we think of ourselves as humans and how these discoveries can change our nature—are considered using topics such as the Human Genome Project, which is determining the complete genetic blueprint of humans, the implications of our newfound knowledge of the genetics of human disease and health, and genetic engineering of plants and animals. How the world of science fiction views these topics is also considered. Landmark progress in science is made by pioneering individuals. Those responsible for some of the key discoveries in developmental biology are highlighted in “Bioboxes” that appear throughout the text. These scientists represent the human side of the wonderful discoveries described in this book. review: "Bier offers the general science reader a well-illustrated and accessible account of our current understanding of how fertilized eggs are transformed into complex organisms (flies, worms, vertebrates, and plants). He discusses classic experiments in developmental biology, recent research that offers mechanistic explanations for these observations, and the scientific and ethical implications of current embryological research. He also highlights the stories of 17 individuals responsible for many of the key discoveries he covers." 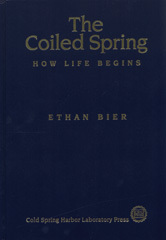 review: "Ethan Bier has focused on most of the best understood developmental systems and the most studied processes within them. In contrast to larger developmental texts, which often introduce but do not answer the questions, Bier delivers the ‘best of’ developmental biology. This material can be covered in a shorter course. The choice of material is excellent, the writing is crisp and clear, and the illustrations are very good. …Bier's enthusiasm, fascination, and reverence brighten the text—as does his fondness for science fiction". review: "Ethan Bier has written a wonderful book that distills the essence and current highlights of modern developmental biology and genetics. It is broadly written for a general audience but detailed enough to provide a useful review for specialists. The initial chapters of the book prepare the naïve reader to understand the central dogma and the modern methods of molecular genetics and embryology. The author then presents two chapters each on Drosophila, vertebrate, and plant embryo axis formation and appendage patterning, creating a well balanced view of life. The final chapter is on the ‘Future of Biology and Man,’ discussing the relevance of embryological studies to biomedical research and human health. The author should be praised for being particularly speculative in this last chapter yet alerting the naïve reader when discussions spill over into science fiction. This chapter is refreshingly current and should result in The Coiled Spring being a very current text for years to come. Bier writes in a very clear style that not only conveys knowledge but also great excitement for the subject. There are very helpful glossaries throughout the book and beautiful illustrations that are very clearly presented. In addition, Bier has added ‘Bioboxes,’ vignettes on the lives and careers of some of our leading scientists in this field who provide opinions on the most important aspects of scientific discovery. These Bioboxes provide the human element to this exciting field of biology and may inspire current students. Finally, this book sets the stage for subsequent books, including one that would highlight the achievements in developmental biology that have led to knowledge of human disease and one that would go beyond the standard animal and plant model systems to show how an understanding of the core developmental mechanisms are altered to create the amazing diversity of life on earth." review: "Bier clearly loves explaining science and cares that everyone should be able to understand his story. He uses several tricks to help both the non-specialist and the biologically trained reader along. Above all, he enjoys finding striking metaphors to describe complex phenomena (for example, he compares genes in cells to electric appliances in a kitchen, which are on and off in different combinations depending on the task being done in the kitchen.) The text is peppered with such metaphors, which makes for entertaining reading and does help to get the important points across."